24 Volt 3 Ton load range. 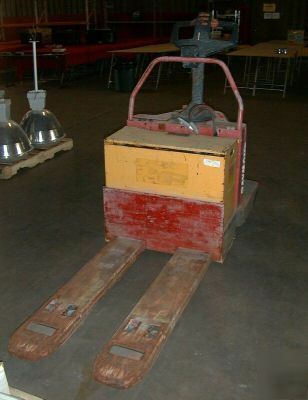 Fork ID 9" OD 27" Truck weight with max battery 2600 pounds. Has power, holds charge. Has coast/no coast switch for riding. Original operator's manual included. Now, our very own "fine print:"
PLEASE DON'T MAKE US REJECT LOWBALL OFFERS. IF WE ARE EXTREMELY OFF-MARKET LET US KNOW BY EMAIL. INCLUDE EMAIL ADDRESS IN YOUR MESSAGE FOR RESPONSE. Agrees to accept the item in its described condition.